Even a novice at outdoor cooking can serve guest-worthy trout by preparing it in a foil packet on the grill. With this cooking method the fish won’t fall apart, dry out or stick to the grill rack, and it works with a campfire grill as well as a backyard gas grill. Adding vegetables makes each packet a meal -- easy to cook, easy to serve and easy to enjoy eating. Trout is a mild-flavored fish that may be grilled with the head on, headless or as boneless fillets. If you’re grilling the trout on the bones, gut and scale it. Be sure to remove the blood vein that runs along the inside of the trout’s spine; leaving the vein in can ruin the flavor of the fish. Remove the vein easily by drawing a spoon tip along the spine in the cavity of the trout to scrape it out. 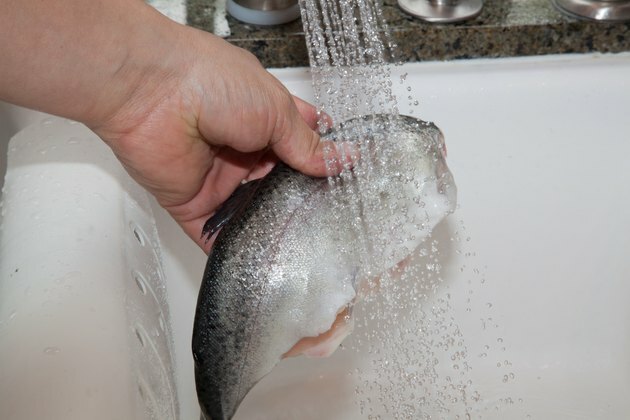 Rinse the fish thoroughly under cold running water. Heavy duty foil makes a sturdy packet that withstands handling on a hot grill. Tear a sheet of foil a few inches longer than the fish and place the fish in the center. 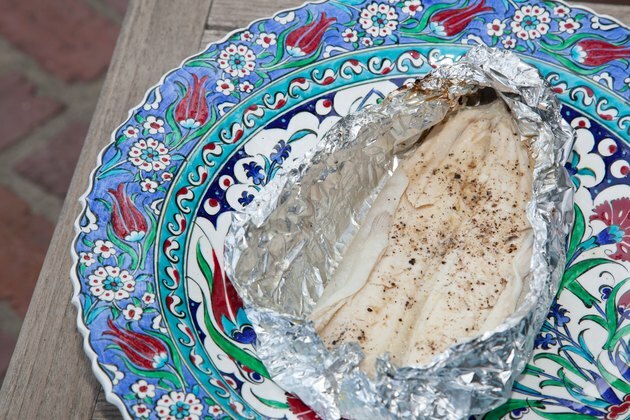 Create the grilling packet by simply folding and crimping the foil around the fish, sealing the edges to retain moisture. 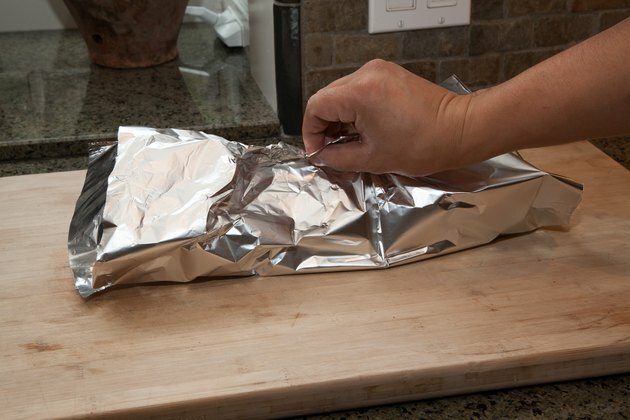 Spray the inside of the foil before wrapping to keep food from sticking, or use non-stick foil with the dull side facing the fish. 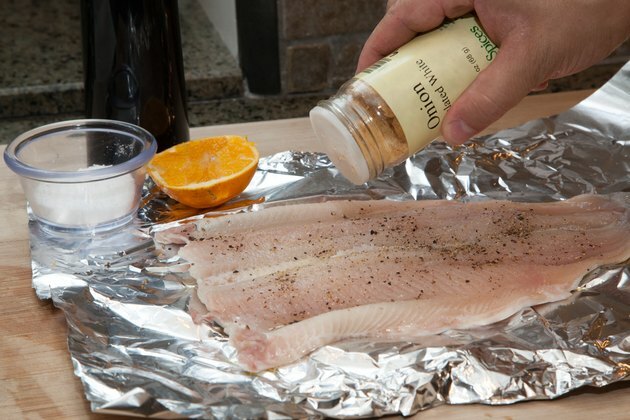 A foil pouch means that you can seal in seasonings and vegetables with the fish as it cooks to intensify the flavor. Seasoning can be as simple as placing lemon or lime slices in the cavity of the fish with some sea salt and ground pepper. Combine delicate herbs such as dill, tarragon and parsley with mild onions for lightly flavored fish, or add your favorite sliced vegetables to round out a meal. Choose vegetables such as peas or summer squash that cook quickly, or slice hard vegetables such as carrots or potatoes extra-thin so they’ll be done in the time it takes the fish to cook. Place the packets on the grill, spacing them at least 1 inch apart so you can turn them easily. Start packets that contain vegetables with the fish on the bottom, keeping them on a raised rack to keep from scorching the fish. The vegetables steam as the fish cooks. You can flip the packets a few minutes before removing them from the grill to make sure the vegetables are done. 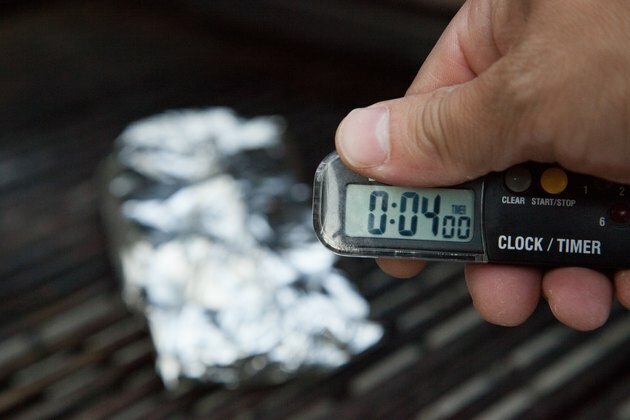 A foil packet containing fish without vegetables generally needs to cook on a preheated grill for 4 to 5 minutes on each side. The grilling time depends on several factors, such as how close the rack is to the coals or flame, the size of the fish, whether you’re co-cooking fish and vegetables, and if the grill is open or closed. If the grill rack is filled with packets, switch their placement when you turn them -- center packets to the outside, outer packets to the center. Visually check the thickest part of the fish for doneness. Properly cooked fish is opaque and it flakes easily with a fork. Open each packet to check, resealing the foil and returning any that aren’t done to the grill.